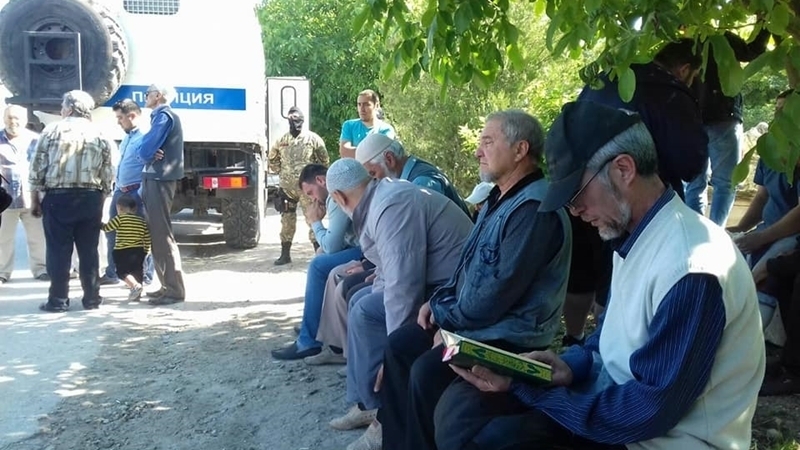 Crimean Tatar activists gathered near the house of the Crimean Tatar Server Mustafayev detained by the Russian security forces of the in the occupied Crimea in Bakhchysarai. Mumine Salieva, the wife of the political prisoner Seyran Saliev, shared the corresponding information on her Facebook page. “The entire bloom of the nation is now at the house of the Server Mustafayev and along the road. Veterans and activists of the national movement of the Crimean Tatars. Our intelligentsia in the face of doctors, teachers, educators. Businessmen. The youth. Wise old people. Families of those who have already been searched and abducted. And simple people who are not indifferent," she wrote. Mumine Salieva noted that Mustafayev always called for supporting each other. "And now, when the trial has befell him, we all see the unity of our people," she noted. QHA reported that in the occupied Bakhchysarai the security forces detained two Crimean Tatar activists. Server Mustafayev and Edema Smailov are accused in the contrived "Hizb ut-Tahrir" case. Earlier, the security forces conducted searches in the homes of Crimean Tatars Server Mustafayev and Edem Smailov. In the house of Eden Smailov three children were blocked, his wife was not allowed into the house. The security officials did not allow lawyer Emil Kurbedinov to Mustafayev.